How long to cook? Preheat the oven to 325o, then place the bird in the oven to roast for 15 - 20 minutes per pound. How big a turkey? You'll need 1 1/2 pounds of turkey per person if you're buying the whole bird, fresh or frozen. Prep time: If buying a frozen turkey be sure to let thaw overnight. Many cooks also reserve extra time for brining a turkey for several hours beforehand. Brining (a salt and herb bath) simply results in juicier white meat, and tastier dark meat. When it comes to turkey stuffing, our advice is to make your turkey stuffing separately to avoid having to truss the turkey legs. Leaving the body cavity empty will also speed up roasting time. Finally, before turning on the oven remember to position an oven rack in the bottom third of your oven so the bird sits where it can cook thoroughly but evenly.  What wine with turkey? 1. Take the defrosted turkey from the refrigerator and remove the outside packaging. Check the body and neck cavity and remove the packaged giblets. Set the turkey breast-side up on the roasting rack. Let it sit for about 10 minutes or until it comes to almost room temperature so it will cook more evenly once inside the oven. 2. Preheat oven to 450°F. If you did NOT put your turkey through the brining process, now is the time to rub the turkey with butter or oil and sprinkle with salt and pepper for a tastier bird. 3. Pour two cups of chicken broth or water into the roasting pan. Place the pan in the oven and roast the turkey for 30 minutes at 450°F (to seal in the juices), then turn down the heat to 350°F. 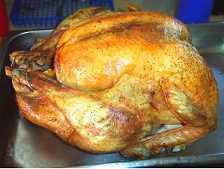 Place a sheet of aluminum foil to "tent" the bird for more even cooking throughout the rest of the roasting process. • Basting - about an hour into the roasting time, use a turkey baster or large spoon to scoop up the juices from the pan and drizzle it over the breast to keep the meat moist as it cooks. • Un-tenting - In the last half hour of roasting, remove the sheet of aluminum foil to help turn the breast a deep golden brown. • Temperature check - The old-fashioned way of checking for doneness is to grab the end of a leg - if it wiggles the bird is done. Otherwise, use the modern method of inserting a cooking thermometer inside the breast. Once the temperature reaches 165°F your bird is done. • De-juicing - Save the juices from the pan! You'll need it make a tasty turkey gravy. 1. Assuming you've saved the turkey drippings, skim off the excess fat that has risen to the top. Heat the four cups of stock in a saucepan and add the turkey drippings. 2. In a separate pan, melt four tablespoons butter over medium heat. Stir in four tablespoons of flour to make a paste. Continue to stir for a couple of minutes until the mixture is golden brown. 3. Slowly pour the hot stock into the pan with the flour mixture, whisking as you add it. Continue to simmer and whisk the mixture until thickened. * Remember that a brined turkey will result in extra salty drippings, in which case all you need do is add the pepper. First, make sure to let the turkey cool down, then remove the wings at the joints (where they attach to the breast.) Do the same with the legs and the thighs. Now that you're left with just the breast, take a large fork and stick firmly into the middle of the breast to steady it as you carve. Next, use a large carving knife to begin carving slices from one side of the breast, then the other. If you think of a turkey as just a big chicken, it's easy. The secret to easily carving a turkey is to let it cool down for 15-20 minutes to let the meat firm up. If your slices appear to crumble or fall apart as you slice them - STOP. The meat is too hot to carve. One of America's most popular brands, with online videos to show you how to thaw, stuff, roast, carve or grill, and check out the live Turkey Talk-Line for one-on-one instruction. No fancy graphics, but plenty of warnings to keep it safe and hygienic. It's important information and they do a good job covering the basics. The beginners guide with step-by-step instructions and plenty of photos to help you follow along. Everything from cooking techniques, to carving the bird, to what to do with the leftovers, courtesy of the University of Illinois Extension. And check out a huge helping of Turkey Side Dishes. With complete instructions, and if you happen to have a big enough roaster, it's a good idea for freeing-up space in the oven for the side dishes. Check out this five-star rated recipe with complete instructions, plus browse the left-hand menu for more on citrus and orange turkey brining techniques.